My week is moving right along~I am a little behind these days due to a lot of snuggling going on with my new Granddaughter! I went on a mission to find a fun tag to create to fit the theme. My tag and cute little bear were found at the Silhouette Store. After cutting the tag, I used the print and cut feature on the Cameo for the darling bear. This feature makes it so quick to mass produce! The sentiment is stamped with My Creative Time's Best Bots Forever stamp set. I added a few touches with some doodling, glossy accents, twine and tulle and viola, done! 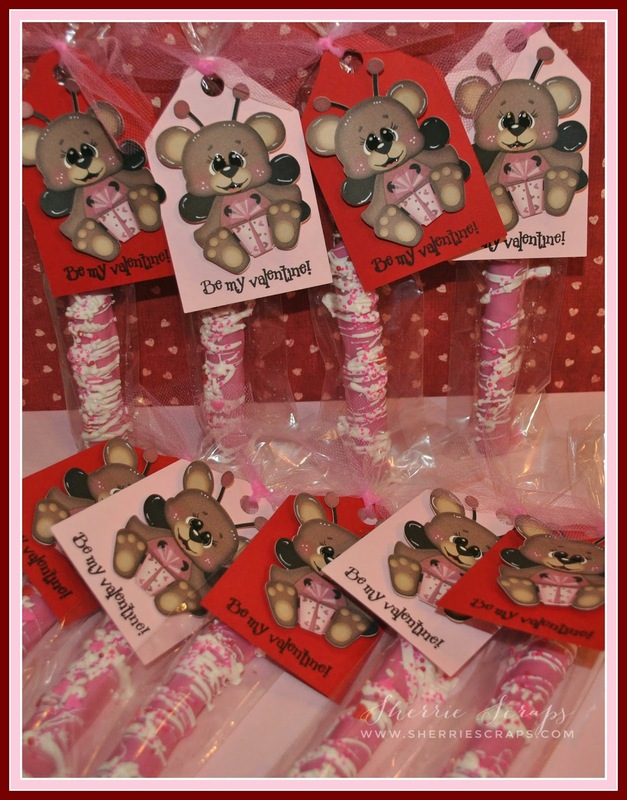 Sherrie ~ Oh my these bears are seriously ADORABLE!! I LOVE the faces and the little details you added to them!! Then that is my favorite font ever ~ so I adore that sentiment! Alright I want a pretzel rod now ~ YUMMY! Okay stalking is done ~ for now! Have a fabulous day! Oh Sherrie, these are so absolutely adorable!! Those bears are soooo sweet!! I love those adorable faces!! And yummy - the pretzel sticks look so delish!! I know your friend adored these - they are fabulous!! Give that sweet grandbaby a hug for me!! And sweet Arya, too!! Have a wonderful evening my friend!! These are so, so sweet! What a yummy treat - and those tags look fabulous! I love that you added a bit of doodling to them. So happy that you're enjoying cuddle time with your newest granddaughter. This is precious time to be treasured!! Too cute and yummy. Love the bears, their cute faces are so sweet. Yummy pretzels (my fav). I know you friend loved these. Oh how stinkin cute!!! Love the pink pretzels! The packaging and toppers are just gorgeous Sherrie.... makes me wish I was the recipient! Thanks so much for linking these up in our Funday Friday challenge!! These are so cute! I am sure your friend must have liked them. These are positively adoramous, Sherrie!!! LOVE that sweet bear. They are all ADORABLE and YUMMY too! The tag is adorable and the pretzel stick look delicious! These are so super adorable Sherrie!!! What a sweet Valentine's Day treat!!!!! Congrats again on your new granddaughter!!!!!! Just darling- I need to get working on my print and cut feature on the Silhouette! Mmmmm the pretzels look delicious too. Big Congrats on the new G-daughter and here's to lots more snuggles!!! Seriously adorable little treats my friend! 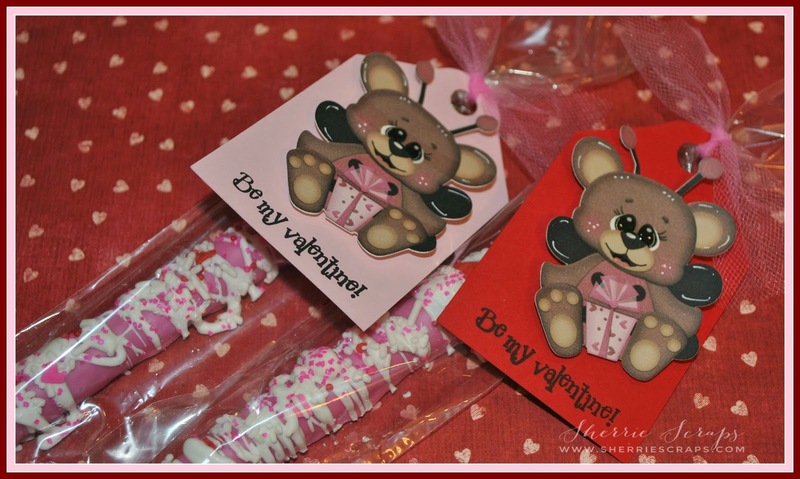 Those little bears turned out so cute and the pretzels look super yummy! 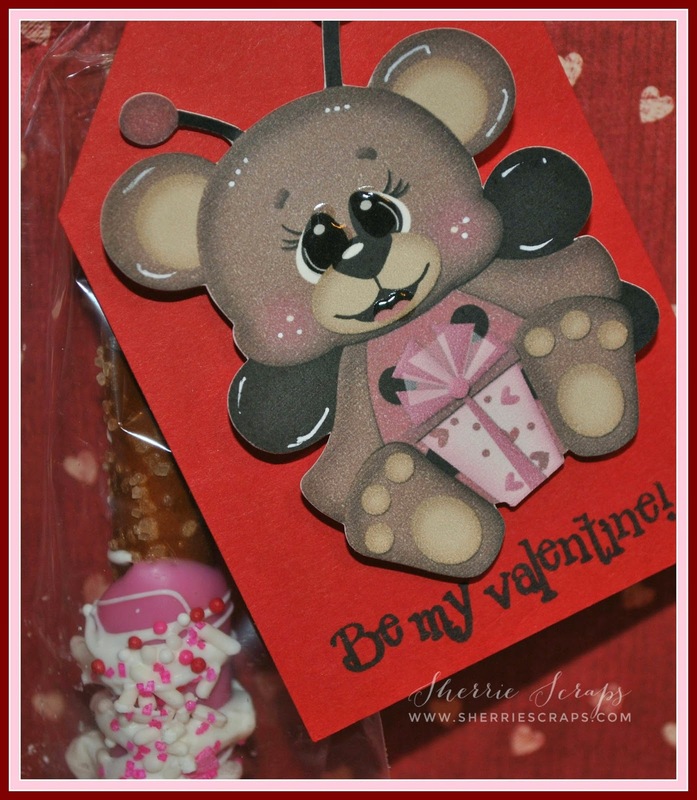 Sherrie these are absolutely adorable, I just love that little bear!! These are adorable. Thank you for sharing them with us at FCCB.